The Sciatica SelfCare System is an innovative product for relieving sciatica pain at home. The recently released product uses a breakthrough approach for sciatica relief unlike any other product currently on the market. Developed and researched in a clinical setting for over 25 years, The Sciatica SelfCare System's beginnings are as novel as the product itself. Years ago, Perry Savage heard a loud "crack" in his back. The good news: He was in a chiropractor's office at the time. The bad news: He was the chiropractor, not the patient. "I was adjusting a very large patient and my own body was in an awkward position when I made the thrust" recalled Dr. Savage. "I heard the typical "cracking" sound associated with an adjustment - I expected that. What I didn't expect was the "crack" to come from my back, followed by a lightning bolt of intense pain down my leg - sciatica". "The pain dropped me to the floor, while the patient looked on helplessly", Savage remembered. "It was all quite surreal". That was thirty five years ago. From that painful experience, an innovative product for relieving sciatica pain at home was born. Called The Sciatica SelfCare System, the product uses specialized wedges, called Sciatica Relief Wedges, plus sciatica relieving exercises to reduce, and sometimes completely relieve sciatica pain at home. During an eight to fifteen minute session, the Sciatica Relief Wedges gently rotate the sciatica sufferer's lower back and hips into a position that releases unhealthy pressure on the parts of the body that cause sciatica. During his own bout with sciatica, Savage innovated the use of the Sciatica Relief Wedges for home-care. Traditionally, the wedges had only been used in chiropractic offices, limiting the wedges' benefit to a sciaitica patient in pain to two or three times a week. During his recovery, Savage opted to test a theory of his - perhaps if the wedges were used more often, the result would be enhanced. He increased his use of the Sciatica Relief Wedges to three times a day. Savage made that possible by having his chiropractor teach Savage's wife how to position the wedges in the precise spots under Savage's hip to relieve his sciatia. After that, Savage's chiropractor need not be there each time the wedges were used. Three times a day, Susie positioned the wedges under Savage's hips, giving him welcome relief from sciatica. "From that point my recovery took off", Savage said. "I was back to work four days later", he recalled. Dr. Savage benefitted greatly from using the Sciatica Relief Wedges - so why not offer the same benefits to his sciatica patients? He began suggesting to his sciatica patients that they bring in a "Helper" - typically a spouse or other family member or friend - and he would teach the "Helper" how to precisely position the wedges. Over the next twenty five years, Dr. Savage taught hundreds of "Helpers" how to precisely position the Sciatica Relief Wedges under the hips of their spouse, other family member or friend to relieve sciatica pain at home. It was a win-win situation. The patients enjoyed the previously unavailable" at-home" relief of their sciatica. Dr. Savage felt rewarded by the many thanks and referrals he received from hundreds of sciatica patients when they were pain free and able to get back to work and enjoy their lives again. 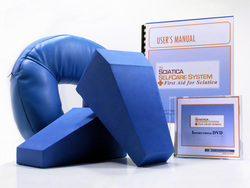 After retiring in 2005, Dr. Savage finished development of The Sciatica SelfCare System. He produced an Instructional DVD and a User's Manual, allowing anyone in the world to easily learn how to be a "Helper", so they can then help relieve the sciatica pain of a spouse, other family member or friend. The Sciatica SelfCare System also includes the Sciatica Relief Wedges, four Sciatica Relief Exercises and a comfortable face cushion. Savage explained the vision of his company, Innovative SelfCare Solutions, is to provide home-based, self-care products that enhance professional care, not replace it. "The Sciatica SelfCare System is the answer to the question 'What can I do at home to relieve my pain and help my doctor get me better ASAP," Savage reported. "I've always believed strongly in getting people involved in their healthcare, instead of relying solely on what their doctor can do for them", Savage said. "At-home self-care makes people feel better while saving them time and money, so I'm sure it will continue to increase in demand and importance". For more information, visit the product's website at http://www.sciaticapainreliefnow.com.